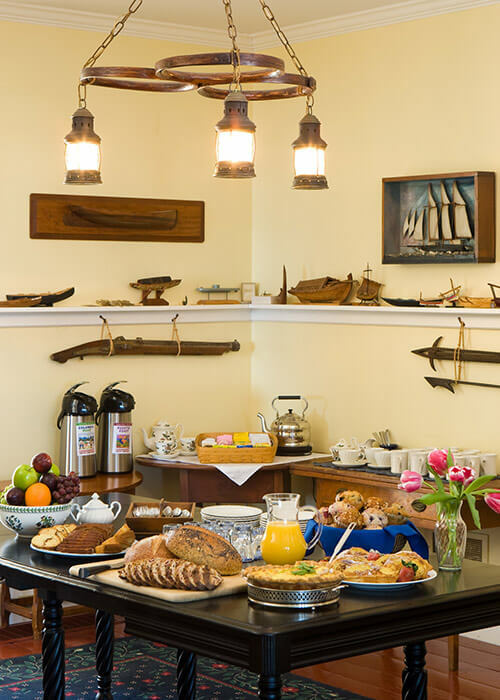 From our freshly made breakfast for guests served in the Maine House, to lunch or dinner at our fine dining restaurant, to lighter fare and drinks on the deck, we offer the perfect taste of New England cuisine at our authentic York, Maine Inn and Restaurant. With all of the fun things to do in York, Maine you need a hearty breakfast to get you ready for a busy day of boating, golfing, sightseeing, or just exploring our beautiful Southern Maine coasts. Your fun-filled getaway demands only the best fuel to start your morning, and our breakfasts will certainly have you covered! A “continental-plus” breakfast buffet is included with your room. A daily egg selection, breakfast-style meat, freshly baked muffins, coffee cakes, and other goodies are baked daily by our multi-talented staff. In addition, we feature When Pigs Fly artisan breads, baked fresh each day here in York. Fresh fruit, cereal, bagels, English muffins, juices, and assorted teas are also available. We proudly serve outstanding coffee from Carrabassett Coffee Company roasted in Kingfield, Maine. Enjoy your breakfast in the casual and friendly atmosphere of the Maine House dining room or on the large wrap-around porch. You may also choose to eat on the privacy and serenity of your own private deck. Any way you choose, it is a great way to start the day! We are able to accommodate most dietary restrictions with advance notice. Get a taste of authentic Maine while gazing at spectacular harbor views at the Dockside Restaurant in York, ME. Embellished with a yacht club atmosphere free of pretense, this eatery is perfect for exploring a diverse new menu. It’s fine dining unlike anything you have experienced before at one of the best restaurants in York, Maine. Using only local and organic ingredients, our York, Maine restaurant is ideal for exceptional food and a memorable meal. Our culinary team are masters of the palate and take extra care in serving you only the finest food. From New England seafood, gourmet salads, or delectable cocktails, our menus are sure to delight. 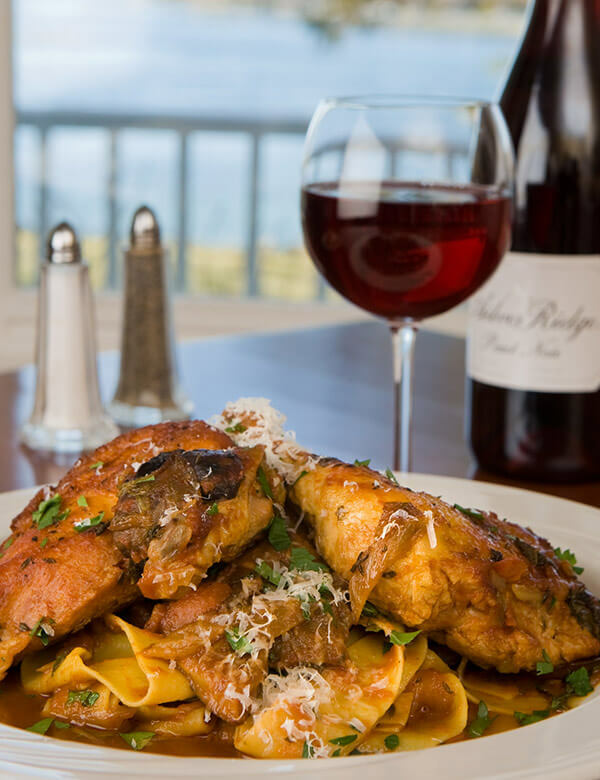 Click below for seasonal menu selections and Dockside’s focused wine list. The awe-inspiring views of York Harbor are not all that has people talking. The Dockside Restaurant has received several praises from critics at Portland Press Herald, Down East, and more! We are known for providing unparalleled service to all guests from the moment they arrive until they leave feeling satisfied. Book your table at the Dockside Restaurant and discover exactly why we are a favorite for many visitors. Want to make your dining experience even more memorable? Retire to one of the luxury York, Maine, accommodations after your meal for a romantic getaway in York, Maine. Reserve your table online or call us at 207-363-2722. Come experience a panoramic view of York Harbor, while dining at our Tiki Bar style Deck at Dockside on Harris Island, near Portsmouth, NH. 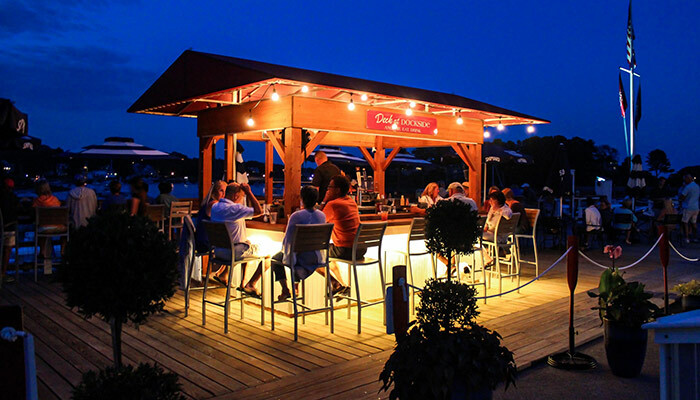 Enjoy expertly crafted cocktails and delicious food in a fun and friendly atmosphere on the water. Our authentic wharf dining menu features salads & proteins, fried & steamed clams, burgers, lobster rolls and more!